I read about this on a book blog years ago, but I found it in the library this month on a whim. It’s a non-fiction read tracking the author’s mission to make new close friends after she and her husband move to Chicago for his career. She hunts down friends of friends, tries out online “friend dating,” and attempts to make conversation with women around her at coffee shops and yoga class. By the end of her yearlong quest, she has made a handful of good friends, but realizes that she doesn’t necessarily need people with the “best friend” title in order to enjoy her friendships with them. 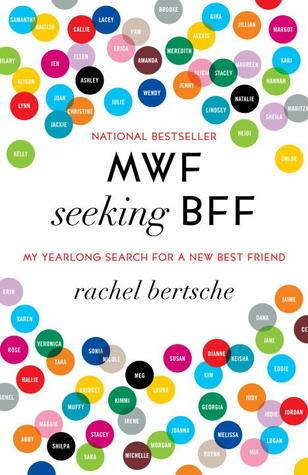 As someone who values having a few close friends rather than a large group of cordial acquaintances, I found Bertsche’s search for friendship exhausting at times. I definitely understand the need to make bonds outside of your partner and his friends in a new place, but I would never go to the extent that she did to make connections. That being said, the concept got a little old about halfway through the book, but it’s definitely an interesting take on female friendships and how time and distance affect them. 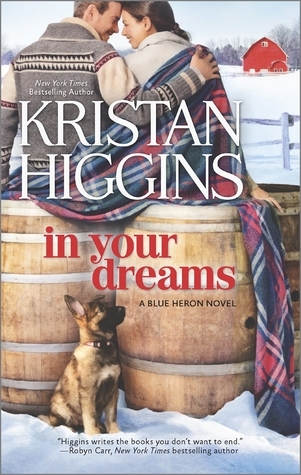 The beginning is typically a very nice place to start, but after unintentionally reading In Your Dreams / Book 4 first, it was only right to continue with the real introduction to the Blue Heron world, The Best Man. Faith, Jack’s youngest sister, was literally about to marry her high school sweetheart when Levi, her groom’s best man, persuaded his friend to come clean about why he couldn’t marry Faith. Cue Faith’s escape to life in San Francisco. 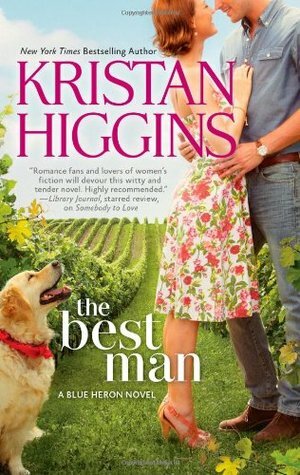 Three years and no new love later, Faith is back in her hometown, helping her family run their vineyard when she begins seeing war vet and police chief Levi in a new light. This book was definitely cute and enjoyable, but I didn’t love it in the same way that I loved Jack and Emmaline’s story. That could partially be because my first exposure to Faith and Levi was seeing them as a happy, established couple in In Your Dreams, but I think I ultimately just related to Emmaline more. However, in Book 2, the love interest for Jack and Faith’s other sister is apparently a British professor, which sounds right up my alley! I’ll definitely tackle that one soon. I’ve known about this book for awhile, but I finally decided to read it after running across the trailer for its movie adaptation. Admittedly, the trailer made me believe that the movie was in theaters everywhere in May, but I think it only had a UK cinematic release and will eventually hit Netflix in the U.S. The story revolves around author Juliet, who is a little stumped about what to write about during London’s post-World War II recuperation. 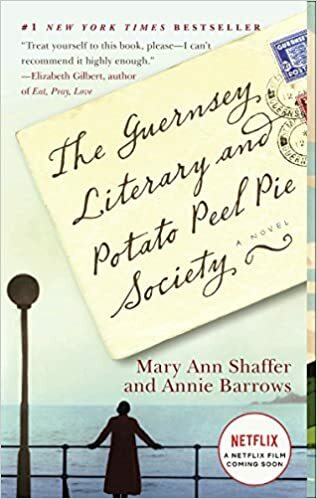 A farmer on the once-Occupied island of Guernsey reaches out to her, having found a book that once belonged to her, and their correspondence eventually turns into Juliet writing to the rest of the island residents and visiting them to pursue an idea for her next book. Told entirely through letters, telegrams, and journal entries, this story wasn’t what I expected, but the writing’s tone reminded me a lot of the Anne of Green Gables books. Anne of the Island is the only book I try to reread every year, so I did enjoy TGLPPPS‘s old-fashioned style. However, the epistolary format does make it seem that nothing particularly major happens, but luckily, it felt like a very quick read. 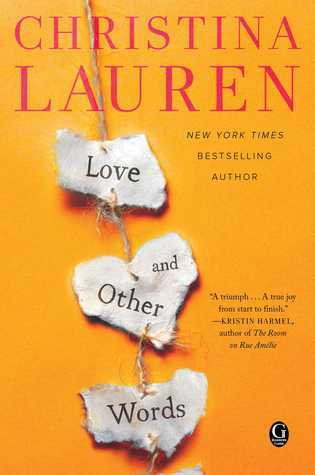 I loved Christina Lauren’s Roomies, so I had high hopes for Love and Other Words, which takes place in both present day and the past. In it, a grown Macy begins to question the past eleven years of her life when she unexpectedly runs into her first love and former best friend, Elliot. As the same gentle, bookish ways of Elliot that comforted teenage Macy after her mother’s death affect her as an adult, the book flashes back to their summers together, eventually delving into what caused them to part ways for all this time. Oh my goodness, this book blew me away. I’m still very torn about whether or not I preferred it over Roomies, but I’ve come to the conclusion that while Roomies’ Calvin is like the fantasy guy with a cute accent, Elliot is more of what I hope to find in a man one day. The writing is immersive and beautiful, and I didn’t enjoy one of the alternating timelines over the other, which is a great sign. I’ve also noticed that Christina Lauren books excel in giving the narrator strong, believable relationships beyond their romance, and like with the uncles in Roomies, Love and Other Words included a heartbreakingly beautiful father-daughter bond. I was a little disappointed with how quickly the end’s twist was handled, but I loved being in this world so much that I can’t hep but give the book five stars. I don’t normally finish books that I’m not enjoying, which prevents any ratings lower than 2 stars, but P.S. From Paris was such a weirdly unique case in which I somehow wasn’t miserable during a very dull and barebones read. English actress Mia leaves her husband after she learns he’s cheating on her and then goes to stay with her best friend in Paris. Elsewhere in the city, American author Paul is struggling with his latest project after the success of his first novel drove him to live in France. He meets Mia when his own friends set him up unknowingly on a date with her. The rest of the story essentially focuses on Paul and Mia’s mutual denial of feelings for each other. I breezed through this during Memorial Day weekend, but the writing was simple and very vague, leaving me with very little connection to Paul and Mia. The dialogue felt very unnatural, and certain plot details, like what Paul did to “save” his friends in the past, were never fully explained. It’s translated from the novel’s original French language, so I can only imagine that the book lost a special element in the switch to English. Yet, because of how quickly it read, P.S. 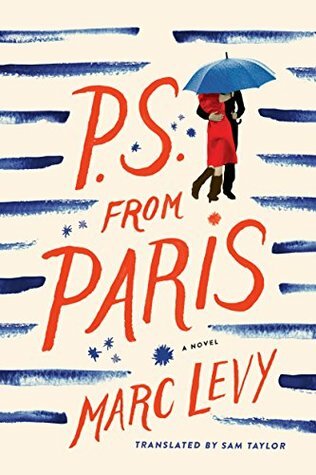 From Paris wasn’t one of those horrible books that just drags on until you have to give up on it. Looking back at it now, nothing about it was really worth the reading, but I’m not particularly angry about wasting time on it. Again, it was a book of rare, mixed circumstances. What about you? What did you read in May? How did you read so much in one month ? What are your reading habits like ?? ?